Slimmer, lighter devices are the goal for most technology companies, but not Kano. In this interview, the designers behind the pioneering STEM toy company make their case for tech products that can be easily disassembled. "As technology is getting more advanced, laptops for example, they're getting way slimmer, more portable," Kano lead product designer Bruno Schillinger told Dezeen. "That's great for usability, but new machines are becoming increasingly hard to prise open." That's because the slim profile of contemporary devices often comes from gluing or screwing components together, making their reuse or recycling nigh on impossible. "The throwaway culture of electronics is just getting worse," continued Schillinger. "Modularity is becoming a thing of the past. But for us it's a really important design feature." UK-based Kano represents one pushback against that throwaway culture. Each of Kano's kits first asks the user to build the hardware, then teaches them how to code on it, before celebrating the finished product – be that a game, artwork or piece of music – through the KanoWorld online community. Lego-style ease of disassembly is so sacrosanct to the company as a design principle that, if a desirable feature were only achievable by gluing components together, that feature wouldn't make it into production. In the case of the company's most recent project, the Harry Potter coding wand, this meant forgoing a light-up tip. Instead, the wand comes in four clip-together pieces that can be easily taken apart again. 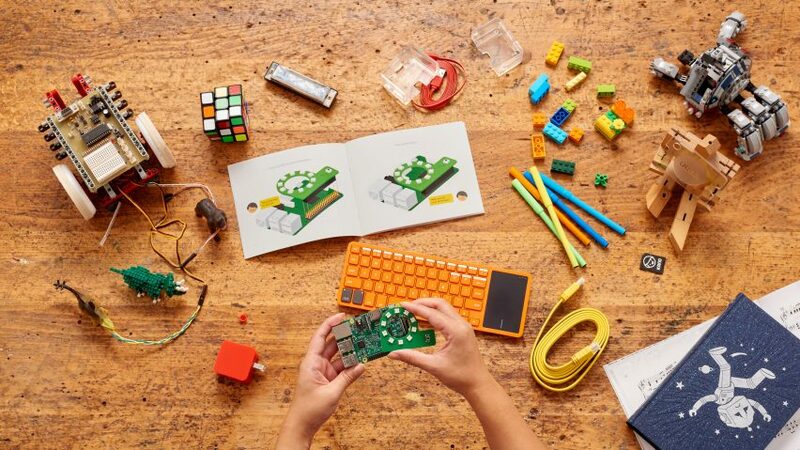 Its motherboard can be reused for other projects if the child has outgrown it – Kano's kits are for all ages, including adults, but 10- to 14-year-olds tend to be the prime audience. The tech is compatible with other Kano kits and many other devices. "That's why we make a big distinction between tool and toy," said Kano creative director Aaron Hinchion. "This is something that you can do whatever you want with." "You can use that wand to turn the lights on in your house, if you know how to do that," he continued. "You can also take it apart and make something new." For Kano, it's a self-perpetuating practice: the products need to be disassemblable so that kids can learn the mechanics of technology, and once kids know the mechanics of technology, they'll be less drawn to closed devices. The section of society that's comfortable playing, making and remixing with electronics will grow. Every aspect of Kano's hardware design is geared towards imparting this awareness – from the often transparent plastic casings, so you can see the innards, to the bright, colour-coded components, with blue for sound, red for power, green for data connectivity and yellow for visuals. With this kind of education behind them, the consumers of the future are set to have very different expectations from their tech. Kano began in 2012, when the six-year-old cousin of CEO and founder Alex Klein asked if a Raspberry Pi computer could be made as fun and easy to use as Lego. Back then, few were doing what Kano was doing. After seeking $100,000 through a Kickstarter campaign for its first product, the Computer Kit, the company banked $1.5 million in a month of crowdfunding. Since then, it has expanded its line to three more kits, shipped 250,000 products, and in 2017 secured $28 million in further funding from investors. It's the gold standard in coding kits (even that six-year-old has shares in the company). Meanwhile, interest in STEM toys – those aimed at developing science, technology, engineering and mathematics skills, sometimes combined with arts to make the acronym STEAM – has shot up. Most toyshops have a section dedicated to the genre, and a recent report by market research firm Technavio forecast that the educational toy sector, driven by STEM, would grow a further 11 per cent in the next five years. The scene is dominated by start-ups, but two of the biggest tech companies in the world, Google and Nintendo, even have build-it-yourself products now, the AIY kits and Labo respectively. "All it's doing is elevating our game," said Hinchion of the increased competition, adding that heightened interest had enabled the company to enter the mass market, with stockists including US big-box stores like Walmart, Target and Best Buy. It was through Walmart that Kano was introduced to Warner Bros and began work on a Harry Potter-themed kit – what the company hopes is the first of many brand collaborations. "We want to see ourselves as a brand that can collaborate with other licenses in the same way that Lego does, where they take their brand and another brand and make this beautiful crossover, blending the visual language of both," said Schillinger. At the heart of Kano is a platform that allows users to program by shifting around brightly coloured blocks, simplifying the concepts and eliminating the foible that most puts off novice coders – typos. While the kits teach coding, they're not meant to steer every user into an IT career. "The things that you're learning from coding, you're not necessarily going to apply them in code, as an engineer," Kano's director of software experience Mike Greer told Dezeen. "The skills that it teaches you is what we focus on: decomposition of a problem – how do you solve something by breaking it down into steps – understanding how you can use sequencing to carry out those steps in a certain order to solve the problem, and then also numeracy and literacy in general," he continued. "Computational science is a useful skill for understanding how to deal with most problems in life." Greer says these skills will continue to be useful and in demand, even as the nature of software development evolves and more of what we think of today as coding is done by artificial intelligence. And Kano plans to keep pushing the boundaries of what it can simplify for beginners – the team has set its sights on machine learning next. Above all, they see their products as fostering creativity. Kano avoids pushing "coding for coding's sake", believing that's not what draws people to learn. "When people go into code, they don't go in thinking, 'I want to code', they go in thinking 'I want to make a game' or 'I want to make this drawing'," said Hinchion. "We don't ever say to kids 'you're going to be an engineer when you grow up because you've learned how to do that on this Kano kit'. No, you've taken a step into this world that was previously hidden, and you've made a beautiful piece of art because of that," he continued. Besides, "one thing we really don't want to be seen as is homework." The team has honed the craft of designing for children, particularly the older age group. They regularly host workshops at their offices – currently a temporary set-up on the fourth flour of an office block in east London, though they'll be moving to a more playtime-conducive setting later this year – and go into schools to test ideas and prototypes. Apparently kids love being guinea pigs, but testing is usually more about observation than verbal responses. According to Greer, children can be "terrifyingly good" at knowing what you want them to say, and so not giving their real thoughts. The wand, they say, was always a hit, but a potions kit and broomstick kit weren't quite working. Other products have required a change in direction. The upcoming camera kit, due in 2019, was initially focused on taking beautiful photographs, but they saw that their subjects were much more interested in chaos than beauty. The kit will lean into that. "It's sometimes about finding the things that they would clearly rather do with the product," said Hinchion. The Harry Potter Kano Coding Kit is available for pre-order via the Kano website, and will ship on 1 October 2018.